Create your own custom bullet patterns and weapon configurations with ease. Save them to weapon inventories and use them in-game. The sky is the limit. Edit your bullet properties, patterns and work with custom ammo and magazine assignments too. 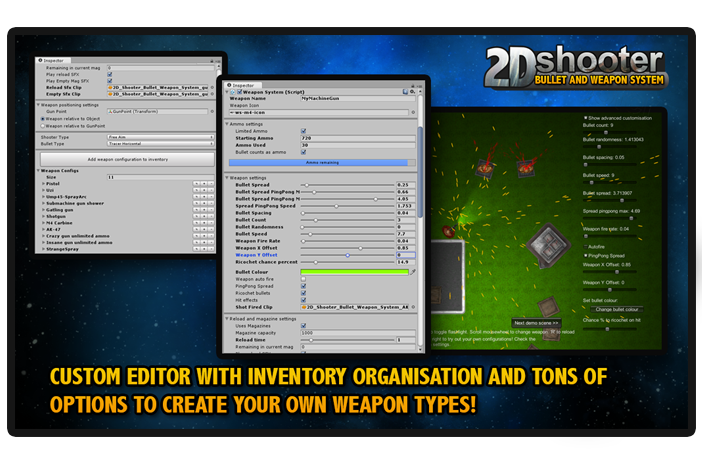 Custom editor allows easy editing of bullet and weapon configurations, as well as inventory. High performance, high bullet counts, and tons of customisation and features. 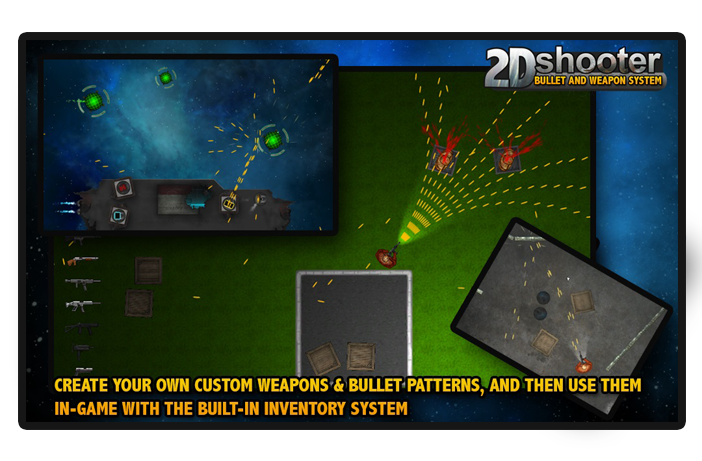 Here are some highlights of the 2D Shooter Bullet and Weapon System for Unity 3D. Be sure to watch the demo showcase video above for a look at the system's features in action. Customisable weapon system module, with tons of bullet options allows for many different kinds of bullet patterns. Fast, efficient, and friendly support. Just take a looking at the reviews on the Asset Store to see how customers love the support provided. Additional effects and bullet features like blood spray, bullet ricochets and sparks. 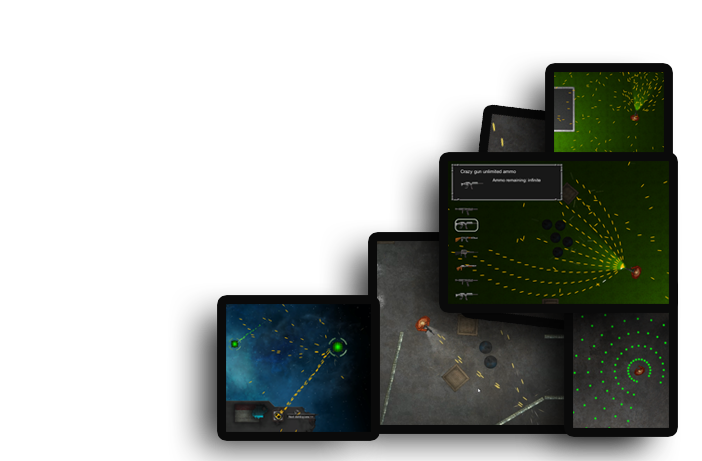 High performance with a built-in object pool, making the system mobile friendly, even with hundreds of bullets on-screen. The system is simple to drop into your Unity game or project and start using right away. In addition, you also get a customizable player movement script which allows for two modes of player movement controls (top down shooter and shoot-em-up/shmup), as well as a multitude of extra sprites, SFX, prefabs and demo scripts relating to the 4 x demo scenes that are included. 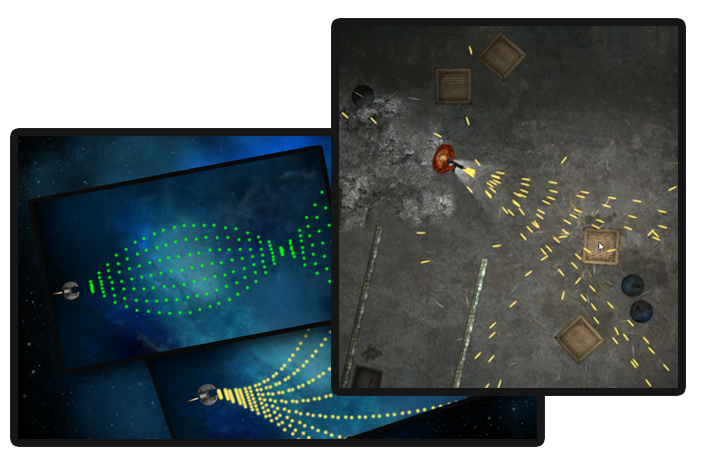 Easily add bullet patterns and weapons to your 2D games!